Fox News host Sean Hannity opened his program  on the night of October 17 by promising “explosive new evidence on what is becoming the biggest scandal -- or at least one of them -- in American history.” Special counsel Robert Mueller’s investigation into ties between President Donald Trump’s associates and Russia has captured the attention of the mainstream press. 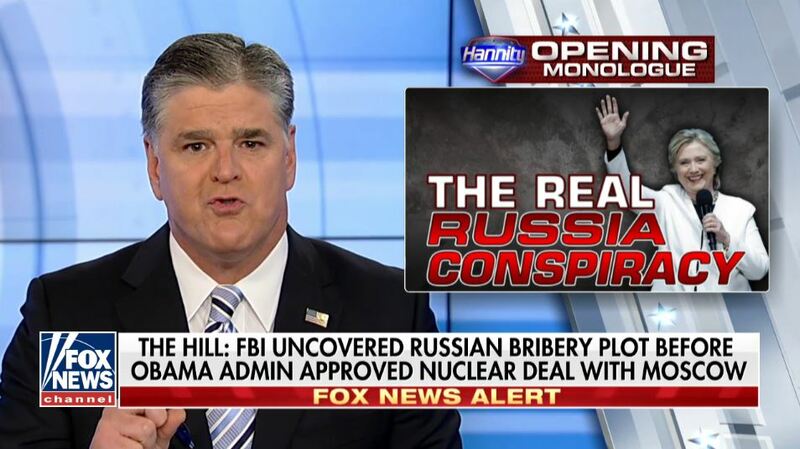 But Hannity, a fervent fan and sometime adviser  to the president, focused his audience on what he termed a “big bombshell” from The Hill on the “real Russia collusion story.” Hillary Clinton, Hannity claimed, had “sold out America to the Russians” by approving the Russian nuclear energy agency’s 2010 acquisition of Uranium One, a company with licenses to extract U.S. uranium. According to the Fox host, Clinton had benefited from Russian government bribes and then the Obama administration had covered it all up. The story was so damning, Hannity said, that Mueller and Congress should shut down their Trump probes immediately and instead focus on the allegations against Clinton. Hannity’s segment was the first in what became a network obsession. Over the past three weeks, Fox has spent nearly 12 hours discussing Uranium One. Trump himself seized on the story, at first directly responding to the network’s coverage . And Hannity’s demand  that Congress “do its job” was answered within days when House Republicans launched  an investigation into the deal. The problem, of course, is that the Uranium One story is a bogus conspiracy theory , a sloppy mishmash of shoddy reporting, fabrications, and motivated reasoning whose central premise -- that Clinton played a role in the deal -- has been debunked. The president and his allies in Congress and in the conservative press -- particularly at Fox News -- have created a phony scandal to divert attention away from Trump’s Russia ties, focus criticism instead on their longtime foe Clinton, and justify calls to remove Mueller from his post. In the three weeks from October 17 through November 6, Fox News devoted  about 11 hours and 49 minutes to the Uranium One story (all times in this write-up were rounded to the minute). Ten hours and 47 minutes of the coverage came in the first two weeks of that period. Hannity spent  three hours and 27 minutes on the story, which was 29 percent of the network’s total coverage. The program covered Uranium One in 14 of 15 possible broadcasts over the term of the study. Other programs  devoting the most time to the story were Fox & Friends, America’s Newsroom, and Tucker Carlson Tonight, each with roughly an hour of coverage, and Justice with Judge Jeanine, a once-a-week program that nonetheless totaled 52 minutes. Fox host Shep Smith did not mention  the story on his weekday afternoon news program. Over the first week , the network combined for three hours and 46 minutes of Uranium One coverage, led by their pro-Trump opinion hosts. The network's coverage receded to one hour and nine minutes in the third week . Conservative author and Breitbart.com writer Peter Schweizer and his boss Steve Bannon launched the Uranium One tale  in Schweizer’s 2015 book , Clinton Cash. Schweizer alleged that Hillary Clinton played a "central role" in approving the Russian atomic nuclear agency’s purchase of the mining company. He suggested that Clinton did so because Russians and people linked to the deal had given money to the Clinton Foundation and to Bill Clinton. A panoply of conservative media figures pushed Schweizer’s allegation; Trump himself parroted it  on the campaign trail. But the conspiracy theory fell apart  when examined by reporters , not least because there was no evidence  Hillary Clinton had actually intervened. This did not deter the feedback loop between Fox News, Trump, and congressional Republicans. Over the following weeks, overwrought coverage from the network’s pro-Trump hosts would trigger  responses  from the president and the House GOP, which in turn led the network’s “news” team to give the story substantial attention. While the coverage has since subsided, an ongoing congressional witch hunt could provide the network with fodder for years to come . Hannity covered the deal in 14 of his 15 episodes during the period studied. The sole exception came on October 20, when he instead aired a special  tribute to the Las Vegas mass shooting victims featuring musical performances and interviews with victims and first responders. Hannity hosted Solomon eight times during that period. Victoria Toensing, a right-wing lawyer  who is representing  a former FBI informant related to the case, appeared on the program five times. 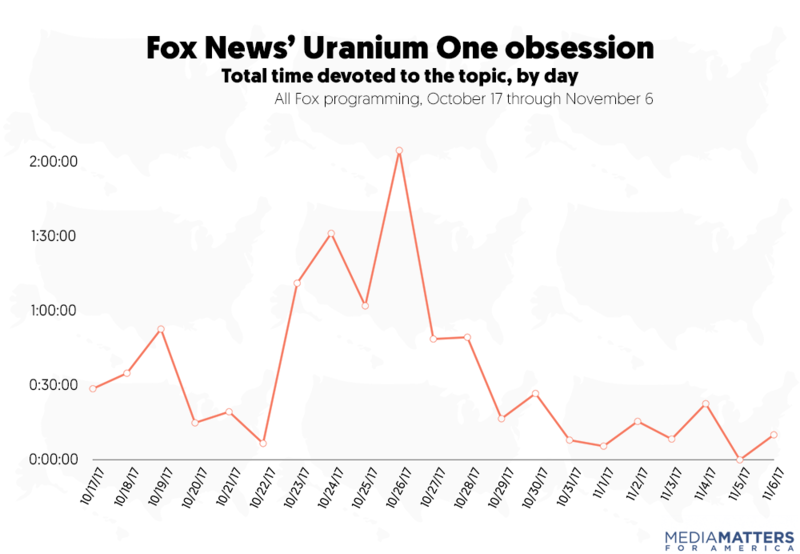 Fox & Friends covered Uranium One during 10 of its 15 episodes during the period of the study, for a total of one hour and nine minutes. This constituted 10 percent of Fox’s total Uranium One coverage during the period. Tucker Carlson Tonight covered the story during eight of its 15 episodes, for a total of an hour, or 8 percent of the network’s total coverage. Justice with Jeanine Pirro is a weekly program that aired only three times during the course of the study but nonetheless accumulated 52 minutes of coverage, the fifth-highest total at the network and 7 percent of Fox’s total Uranium One coverage during the period. The hosts of each of these programs are among the president’s staunchest defenders  on cable news . In particular, the president regularly watches  Fox & Friends and praises its coverage. 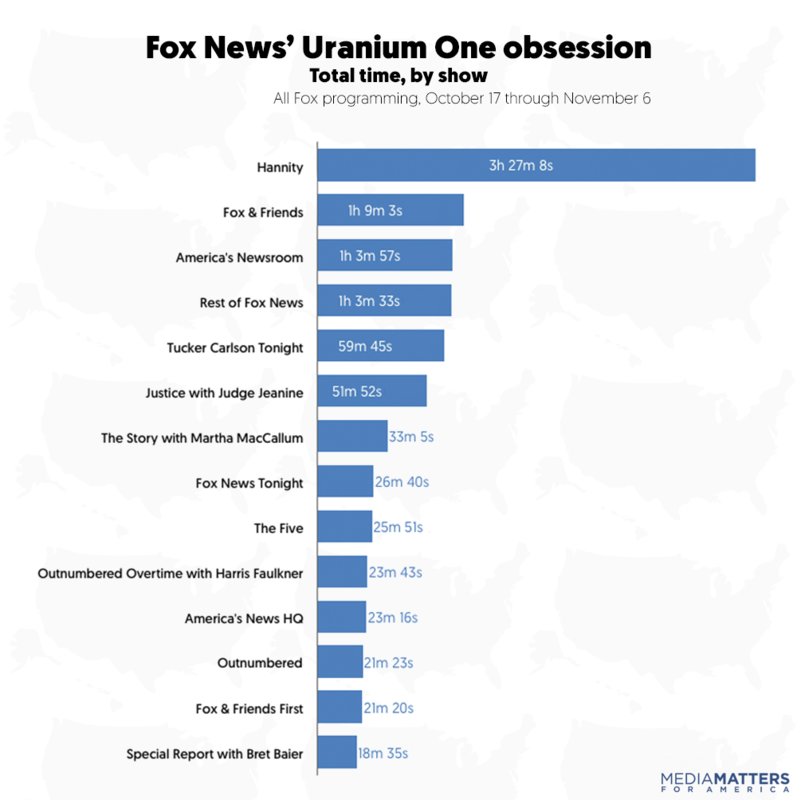 Among the programs Fox presents as “news” rather than “opinion” programming, the two-hour weekday morning show America’s Newsroom was the clear leader in Uranium One coverage, with one hour and four minutes across eight editions. The one-hour weekday shows Special Report with Bret Baier and Happening Now provided significantly less coverage, with 19 minutes over four broadcasts and 11 minutes across three broadcasts, respectively. Fox anchor Shep Smith, whose work stands out  at Fox for its commitment to accuracy and who at times has directly  or indirectly  criticized  other Fox personalities  for pushing falsehoods in support of Trump, notably did not mention the Uranium One story at all during the period of the study. The story was discussed on his Shepard Smith Reporting show for two minutes on October 27, when Trace Gallagher guest-hosted  the program. 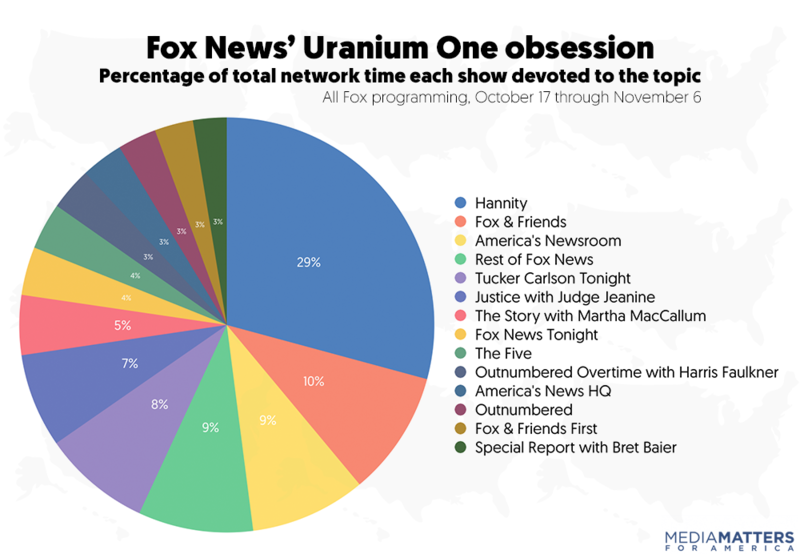 In the first week after The Hill’s story broke, the Uranium One fever spread from Hannity to several of the network’s other pro-Trump hosts, with only occasional mentions on Fox’s daytime “news” hours. That night , Hannity devoted his opening monologue to the story. He also discussed the allegations with Solomon, in an interview with Fox News contributor Newt Gingrich, and in another segment featuring Schweizer and network legal analyst Greg Jarrett. His was the only Fox program to discuss the story that day. But on October 18, the story not only was featured by Hannity, but it also spread  to Tucker Carlson Tonight and The Story with Martha MacCallum. Both shows adopted Hannity’s line that the story proved that it was the Obama administration, not the Trump administration, that colluded with Russia. On the 19th, Fox & Friends devoted several segments to the story. Trump was apparently watching the program and gleefully tweeted along  with it in response, giving the story an added boost. America’s Newsroom also did its first segment on the story that day, interviewing  Toensing. Hannity and Carlson added additional coverage that night. That day, Fox devoted more than an hour of coverage to Uranium One across eight programs, the most of any day up until that point. This included the first Uranium One discussion on Special Report since The Hill’s story broke, with the show using Clinton’s comments  to introduce its report. On October 24, Republicans on the House oversight and intelligence committees announced a joint investigation  into Uranium One. On the same day, Sen. Chuck Grassley (R-IA) called for a special counsel  to review the deal. Trump termed  Uranium One “Watergate, modern age” the next day, while October 26 brought the Justice Department’s announcement  that Toensing’s former FBI informant client could testify to Congress about the deal. But the story isn’t over. Fox maintained steady coverage  of the September 2012 attacks on U.S. diplomatic facilities in Benghazi, Libya, for years, increasing the tempo  whenever events provided the news hooks to do so. The joint investigation by two congressional committees will provide Republican partisans with plenty of opportunities to stir up bogus charges against Clinton and the Obama administration. Congressional Republicans have started  following in Hannity’s footsteps  by using the Uranium One sideshow to call on Mueller to resign. And most of Fox’s on-air talent have already showed they are more than willing to be spun on the president’s behalf.